Custom bbpress styling + custom login system – you can now build a community with ease. Responsive Google AdSense support via our custom admin panel – the script loads a different google adsense spot for each screen size. Once it’s loaded it doesn’t modify it in order to be 100% compliant with Google adSense TOS. Auto YouTube, Dailymotion and Vimeo thumb downloader – just paste a YouTube url and the site will automatically download the largest image available from the clip and it will set it as a featured image. Very easy to add videos to articles. Built in translation support from our admin panel. No more .po .mo files, you just get a form with all the strings from the theme and the corresponding translations. Please visit our support forum. Thanks for your interest in our theme! 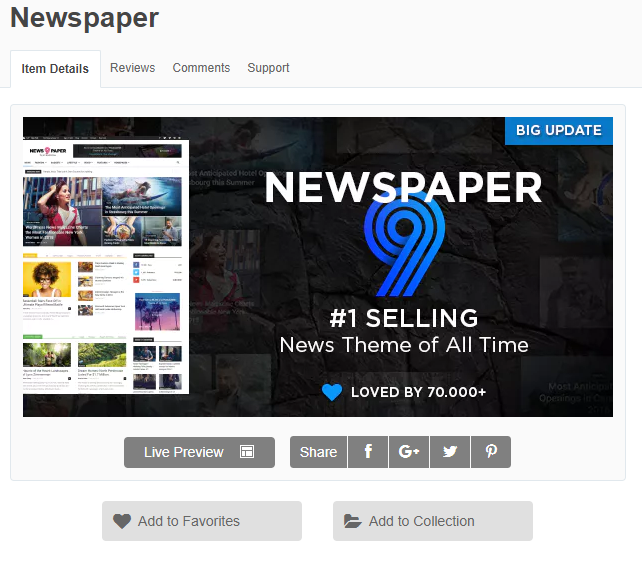 Newspaper Theme is now compliant with the Envato current WordPress Standards – WordPress Requirements. This update is different as it makes changes to the theme’ code structure. It doesn’t influence the functionality and features. However, the update interferes with the child theme customizations. If you’ve made changes only in the functions.php and style.css files, your modifications are safe. In case you’ve altered other files, before updating your theme, please create a test environment and check out the changes there, not on your live website. Find all the details you need to know and do regarding this update in the dedicated article on our blog. new: Added New tracking functions for Google Analytics and Facebook on the Submit button in the Newsletter plugin. new: Sticky Column options now also work for the Inner Columns. fix: Logo structure for W3 Markup Validation. fix: Other various style fixes. improvement: New options added to the Mobile theme for more flexibility. You can now choose the way you display content on small screen devices using Mobile theme and AMP. Is It Your Turn For Identity Theft Yet? Leadership: Leading When You Are Not In Charge!